Traveling in BC's Thompson Nicola on the Trans Canada Hwy #1. In the Native Shuswap tongue, 'Kamloops' means "meeting of the waters". The city offers visitors many historical and native sites worth visiting. At the Kamloops Museum and Archives an impressive selection of gold rush and fur trading artifacts are on display, as well as plentiful information about the area's natural history. 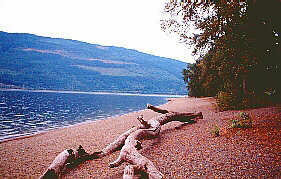 East of Kamloops on the Trans Canada Hwy is Chase, where the Shuswap waterways begin. Access is via either the Squilax-Anglemont Road 10 km (6 miles) east of Chase over the Squilax Bridge to Adams Lake or the eastern route along the north shore of Shuswap Lake. 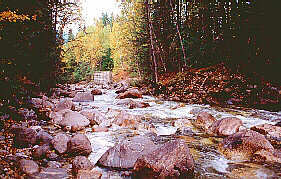 The largest sockeye salmon run on the continent is located here on the Adams River which connects Adams and Shuswap Lakes. Every four years the run is larger than average, (count every four years from the fall of 1998). The park offers excellent fishing, hiking and camping opportunities. Back on the Trans Canada Hwy travel east to the Sunnybrae/Canoe Point Road to Sunnybrea and Herald Provincial Parks, where you may also enjoy good swimming, fishing and hiking. When visiting this park don't miss Margaret Falls. An enchanted trail leads off of the main road to the falls. Named after the south-west arm of Shuswap Lake where large runs of salmon from the different creeks find their way into the lake. 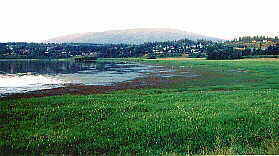 The town of Salmon Arm was founded in 1888. The nearby R.J. Haney Heritage Park is located 5 minutes from town on Highway 97B and is operated by the Salmon Arm Museum. A working blacksmith, heritage house, a museum and walking trails are found within this park. The Salmon Arm Bay Nature Enhancement Area is located off the Marina Park and public wharf downtown. Over 150 species of birds, both resident and migratory make their homes here.